After a period of thirteen consecutive years of our Safety Index Rating, we decided that it is time for a fundamental change both in terms of methodology and calculation in itself. Why is that ? Let me explain. Everyone who’s is involved in the airline business knows about the complexity of the system. There are dozens of factors that come to play to let an aircraft fly safely from point A to point B. We at JACDEC all agreed that its time for a next-level approach in measuring the safety of air-operators throughout the world. For thirteen years we focussed very much on the accident/incident history of each carrier and disregarded the variety of other influential parameters such as systemic operational risks. We found 2017 is the perfect year to start a new method of measuring safety by making full use of our extensive and steadily growing database where we stored over 14,000 single occurrences in civil air-transportation. In addition, we are doing all we can to bundle up all other safety-related factors such as whether an airline has passed a safety audit or whether the country it operates in is able to provide adequate safety oversight or what systemic risks to its everyday operations are prevailing. We also decided it is time to say goodbye to the way we used to present our Index. A three-digit decimal number is no longer suitable to provide a clear and comprehensible depiction of an airline’s safety state. We agreed to express airline safety in a new way, a percentage number. 3) Airline Operational Factors (IOSA, Fleet Age, Route Profile, etc .). The weighting of each of these groups is made up of the frequency of their traceability from our accident database. Instead of merely comparing the accident history with flight performance, we are now also in a position to evaluate all structural risks that affect airline operations. You can find a list of all relevant factors and their definition when you scroll further down on this page. All airlines start with a virtual ideal value of 100%. Then every accident or incident, every dead person, every injured person, every benchmark, every audit and every risk reduced this value by a calculated penalty. The more penalty values an airline collects, the lower (or worse) its risk index will be. operate in a country whose air safety authorities work transparently enough to report on accident reports on a regular basis. All parameters combined are 33, which make up the entire Risk Index. This means 366 % more criteria than before. What does the JACDEC Risk-Index tells me as a passenger ? We all are dealing with any number of risks in our everyday lives and in particular when it comes to air travel. The new Risk-Index is built around the perspective of a passenger who intends to distinguish airlines by their existent level of safety risks rather than their ratio between bygone accidents and flight performance. So we broadened out viewpoint and gather all available criteria which impact the safety of commercial aviation in any way. The new Risk-Index expresses the quintessence of all available criteria influencing the safety of a flight. A crucial section of our safety assessment are environmental factors such as the quality of safety oversight of a country a certain operator (airline) is based in. One lesson of our now decade-long experience in aviation safety analysis is the following: There is a direct correlation between the safety of an airline and the competence and transparency of the regulating authorities. For instance, we evaluate the results of the so-called USOAP, this abbreviation stands for Universal Safety Oversight Audit Programme. In this global program, guided by all ICAO member, the whole civil aviation system is undergoing a voluntary audit. The results of this investigation will be published on a website and can be viewed by everyone. Furthermore, we looked at the level of transparency a governing authority has got. We ask: Are there all relevant occurrences laid on the table, or not ? Compared to earlier years, The past years gave us some encouraging results, but many important players like China, Turkey or Mexico failed to open their accident investigations to a wider audience. While countries like the USA, the UK, Canada, France or Australia took the lead and implemented an exemplary system of reporting, investigation and publishing of any relevant safety cases regardless whether the major flag carriers are involved or not. Also, Brazil, Colombia, South Africa, Germany, Indonesia, Japan, Taiwan and the Scandinavian countries have a comparably high level of transparency resulting in a positive in impact to our Index calculations. Countries that do not or only sporadically publish accident investigations, got a lower rating, such as China, Malaysia, Thailand, and Turkey. Coming back to our index criteria: we distinguish whether an event is a Hull Loss (or total loss) or a Serious Incident: Both will be recorded in our JACDEC Database, but in the final weighting a total loss counts considerably more. As always we include only flights where paying passengers have been on board. Therefore we disregard all non-revenue flights such es freight, ferry, training, military of technical check flights. It may dawn on you that even the best kind of Airline Safety Index must be regarded as imperfect because of the complexity of all it takes to minimize the risk of accidents. We would be a phony to deny that. Some essential sectors like the skills of aircrews or maintenance aspects are only superficially covered. Mostly because there still is a lack of a global benchmark or a transparent supranational audit dealing with those sectors. 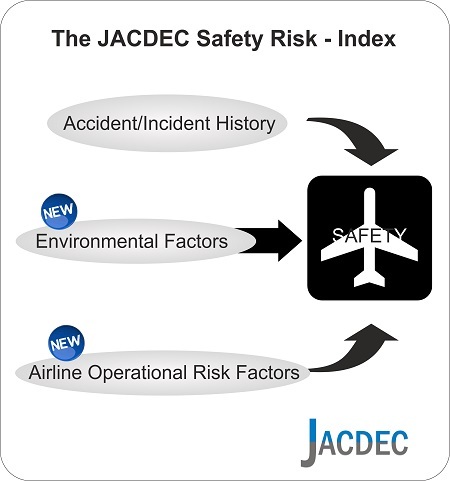 But nonetheless the JACDEC Risk-Index can be regarded as an approximate value and in our view the best possible way to give travelers an idea how different air-operators are doing in the field of safety. And 2ndly we believe it is a helpful tool to compare the larger airlines of the world by their combined safety parameters. The index is based on thousands of accident analysis and a variety of official sources and documents of recognized institutions. To us all accidents that are being investigated and documented by authorities are relevant. As of 2018 more than 3600 official reports have been analyzed by JACDEC. We do not make any difference in terms of cause or guilt. Only passenger flights counted. 3rd party victims in other planes or on the ground are excluded of the Risk-Index. We count only airlines having accumulated at least 4 consecutive years of revenue passenger operation and performed a minimum of 1 m revenue passenger kilometres per annum. Over the years our way of measuring safety has become more and more complex and meaningful. It now has a level which allows us to scientifically compare the safety status of most of the airlines in the world. The current JACDEC Safety Risk-Index calculation is based on a variety of components. Here we name the most relevant of them. 1 Accident / Incident History Annual Revenue Passengers Kilometers( RPKs ) By using this number, we determine the flight performance of an airline. At nearly all major airlines, it is a default value. For calculating the index we use the cumulative RPK ‘s – depending on the age of the airline – 30 years back. A time weighting factor (EMA) is imposed. Fatalities For calculating the index we include all deaths among all occupants on board commercial passenger flights of an airline. (Time from boarding to de-boarding) For calculating the Index we use the number of victims – depending on the age of the airline – up to 30 years back. A time weighting factor (EMA) is imposed. No. of Injuries The Universal Safety Oversight Programme implemented and carried out by ICAO. It has become the global benchmark in determining a country’s ability to maintain a high standard of safety to all its airports, facilities, aviation companies, and airlines. No. of Total Losses All onboard injuries, and serious injuries that need further medical attention. A time weighting factor (EMA) is imposed. No. of Serious Incidents The term “serious incident” is defined by international standards and refers to incidents where an accident was only narrowly avoided. A serious incident is weighted less than a Hull Loss. A time weighting factor (EMA) is imposed. No. of incidents An incident is weighted below the severity of a serious incident but with a potential to affect the safety on board an aircraft. The incident category has the lowest impact on the overall calculation in this category. The 2nd group of influential factors are environmental issues. For example, the safety level of the country an airline operates in, country safety audits and regional safety risks such as weather or topography. The International Aviation Safety Assessment (IASA) is a programme established by the FAA with the purpose to ensure that all aircraft operators registered outside United States that operate to or from the U.S. are properly licensed and are subject to safety oversight provided by a competent Civil Aviation Authority (CAA) in accordance with ICAO standards. Transparency Category By that we mean (as described before) the level of government openness in the field of aviation safety and in particular when it comes to reporting civilian air accidents. It ranks between „good“ (all relevant reports were made publicly available), „medium“ (only few reports available) and „bad“(no reports available). USOAP Audit The Universal Safety Oversight Programme implemented and carried out by ICAO. It has become the global benchmark in determining a country’s ability to maintain a high standard of safety to all its airports, facilities, aviation companies, and airlines. Country Risk Factors 1 All known risks that could have a direct adverse effect on aviation safety in the country. For example, high terrain, seasonal harsh weather (snow + ice, tropical storms). Country Risk Factors 2 All known risks that could have an indirect adverse effect on aviation safety in the country. For example a systemic lack of ground infrastructure and a degraded level of security. The 3rd group, it is the airline itself and all the operator-related risk factors we’re looking at. The International Air Transport Association (IATA) established the IATA Operational Safety Audit (IOSA) Programme, now internationally recognized and accepted, as an evaluation system designed to assess the operational management and control systems of an airline. The aims of the IOSA programme are (1) to improve airline operational safety through the industry’s first globally accepted audit programme using internationally harmonized standards. (2) To improve airline efficiency by eliminating redundant audits. Fleet Age As our database showed us, there is a link between the age of an aircraft and its vulnerability to operational mishaps, incidents, and even accidents. Keeping a fleet youthful means an airline is less susceptible to technical glitches and generally operates on a lower risk level then airlines having older fleets. Route Profile Database evidence showed us that 2/3 of all accident/incident cases happen at or nearby an airport making the landing and take-off the riskiest part of air-transportation. Airlines having mostly long-haul flights (1 – 2 flights per day) have a lesser risk to get involved in accidents compared to airlines with only short-haul flights doing six or more flights per day. Operational Risks All known risks that could have a direct adverse effect on everyday safety for the airline such as airport infrastructure or the amount of overwater routes.